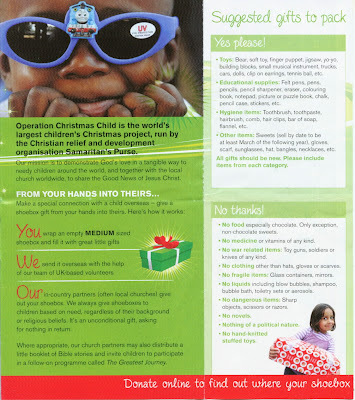 Operation Christmas Child is the world's largest children's Christmas appeal with a heritage of 21 years. Every year Operation Christmas Child is made possible through the amazing support of thousands of children and adults in the UK and Ireland. Last year alone we had the joy of sending nearly 1.12 million shoeboxes bursting with joy from the UK to children living in parts of Africa, Central Asia and Eastern Europe. What's more, Operation Christmas Child can help your church connect with its community, your schoolchildren connect with other children overseas and your workplace connect with a common cause - a child in need. Operation Christmas Child works by taking your gift-filled shoebox - packed, wrapped and taken to one of local drop off points - and hand delivering it to a child in need, asking nothing from them in return. 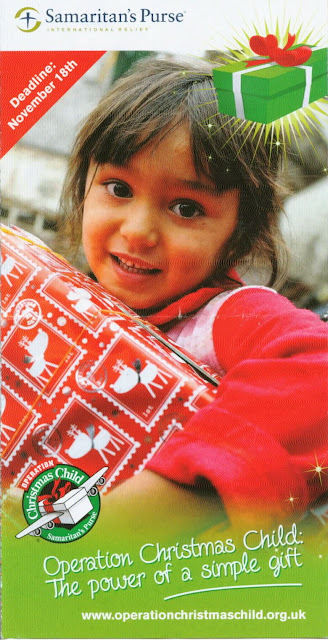 All shoeboxes are given to children in need, with no regard to their background or beliefs. We work with local partners on the ground to ensure that your gift-filled shoebox is delivered with integrity and with respect to the local culture. Where culturally appropriate, our overseas partners will make available a booklet of Bible stories, which gives a message of hope and an explanation of the true meaning of Christmas - God's gift of His Son, Jesus. Come join our Operation Christmas Child campaign this year and bring a smile to the face of a child through a shoebox bursting with joy. Getting involved is as easy as 1-2-3.. Details of where you can drop off your shoeboxes will be available - fromOctober 1st 2012. The deadline for dropping off shoeboxes is Sunday November 18th. N.B. If you are part of a group with more than 50 shoeboxes, someone will contact you around mid November to arrange collection.